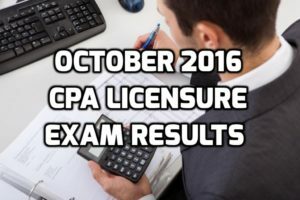 October 2016 CPA Licensure Examination Results Released! The PRC (Professional Regulation Commission) makes an announcement that out of 14,390 test takers who took the October 2016 CPA (Certified Public Accountant) Licensure Examination, 5,249 passed. The test was given by the Board of Accountancy in the key cities of Manila, Cagayan De Oro, Baguio, Iloilo, Cebu, Lucena, Legazpi, Tacloban and Davao. Wesleyan University Philippines’ very own Vhinson Jay Garcia ranks first in the overall CPA licensure examination with a passing rate of 94.33 percent. The registration for the issuance of Professional Identification Card (ID) and Certificate of Registration can be done on the internet from October 26 to November 4, 2016.